When I get older, I will be stronger, originally uploaded by ZackTwin. I am just giving the title as I am having World Cup fever. I really like that WAVIN FLAG song which is very energetic with very good words. I really want to be stronger when I get older. Of course, stronger in term of mentally. When I get older I definitely will be weaker in physical as those sunflowers. I am still using the photos taken during last year vacation because I don’t have nice new photos yet. I edited this photo with masking layer in GIMP. I previously do not like to edit photo with software but now I am enjoying it a bit more. Using software is also part of modern photography, isn’t it? "I really want to be stronger when I get older. Of course, stronger in term of mentally. 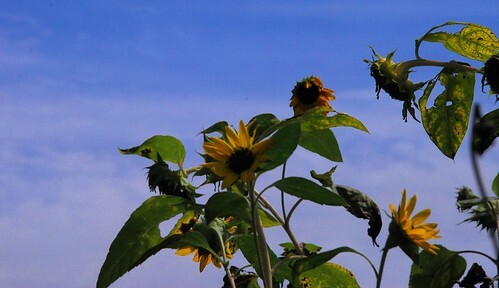 When I get older I definitely will be weaker in physical as those sunflowers. " <--- me too .. me too ... we must cultivate such mental strength from now on..